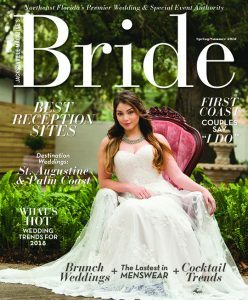 Twice each year Jacksonville Magazine publishes the region’s top resource devoted to serving the needs of First Coast brides and grooms. Our bridal magazine features practically everything a bride needs when planning one of life’s truly special occasions. Reception sites, beauty tips, hot new trends, useful resources, gorgeous gowns, honeymoon destinations, gift ideas—each edition is packed with need-to-know info. And our exclusive list of local wedding service providers gives contact information for the region’s leading wedding industry pros, from cake makers and caterers to jewelers and lingerie shops and everything in between. If you are planning a wedding in Northeast Florida, Jacksonville Magazine’s Bride is a must-read publication. Printed copies of the latest edition of Bride may be ordered by calling (904) 389-3622. Download the Bride Media Kit.